Prompted by the popularity of Fire in the Saturday morning cartoon show, Spider-Man and his Amazing Friends, the go-ahead was given for a four-issue miniseries. However, Uncanny X-Men #193 turned out to be her first appearance as this miniseries was published after that. Chronologically, the first two issues happening before Uncanny X-Men #193 and the last two issues take place after. This miniseries was more of a spin-off from the New Mutants with the Hellions, Massachusetts Academy, and the New Mutants, who made a guest appearance in issue #3. 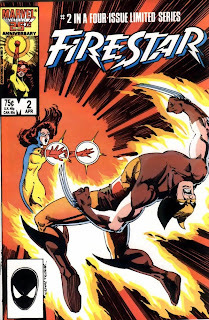 Obviously geared towards young girls, the Firestar miniseries took a page from the Stan Lee/Steve Ditko book of teen angst. Angelica Jones had to adjust to a new school, deal with the sudden emergence of her mutant super powers, and calm her mutant-paranoid father, all the while she’s a pawn in the ongoing battle between the Massachusetts Academy (funded by the Hellfire Club) and Xavier's School for Gifted Children. This ongoing battle was brought to light in New Mutants #15-17. Angelica is taken in by the White Queen tutelage and groomed as an assassin for the Hellfire Club. 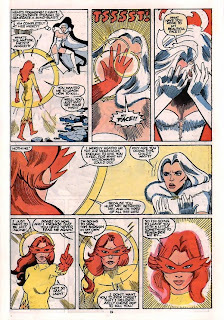 However, after the events in Uncanny X-Men #193, she reevaluates her position with White Queen and turns on the White Queen in the final issue of the miniseries. The writing by DeFalco was your standard super heroes fare mixed in with teen angst. It's what DeFalco writes best (see Amazing Spider-Girl) and he does a pretty good job. The art was decent, but the figure drawings seemed to be stiff and lacked a dynamic feel. This series was a lukewarm start for a young mutant who goes on to join the New Warriors and eventually earn a spot on the Avengers roster. The cover artwork for this series stood out with Art Adams and Barry Windsor-Smith doing the covers to issues #3 and 4 respectively. Jen and I are thrilled to announced that Baby Connor Gavin was born at 1:28pm today. Weighing in at 8 lbs 9 oz! 51cm long and a head circumference of 36cm! Both he and Mom are doing fine. Jen was amazing through it all! We had a wonderful home birth and were spoiled with 3 very attentive midwives!